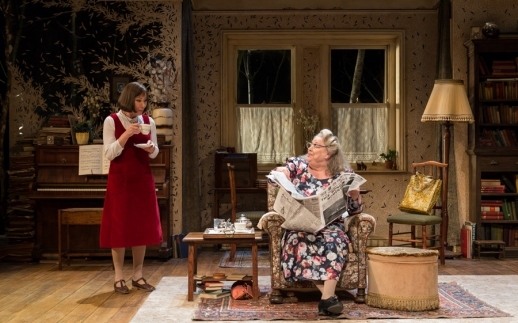 Strangely drawn to the curious life and character of the poet Stevie Smith and a bit of a Zoe Wanamaker fan, I leaped at the chance to see the play Stevie – Hampstead Theatre’s latest production. But the play about the poet, written by Hugh Whitemore in 1977, didn’t quite tick the boxes for me. Not entirely an affectionate portrait of the quirky poet, I soon shuffled in my seat and wondered quite why I had broken my back to make this performance. Wanamaker was, of course, her usual brilliantly amusing self and jollied along the definitely-suburban North London crowd with her descriptive verse of ‘melancholy suburbia’. Having quaffed a large glass of heady red wine in the swish foyer, they were at the ready for some blantant quips at the expense of her eccentric insecurity. We observed Stevie as she lived emotionally dependent on her ‘lion aunt’ while infinitely preferring the domesticated pleasures of sherry and Battenberg cake rather than the company of a lover or husband. Perhaps it was the incessant weaving of her verse into the dialogue which failed to reveal any credibility in her life story? I simply couldn’t empathise with those monologues. So, all in all, the humour and the pathos of Stevie’s situation, combined with some serious desperation, just didn’t do it for me. And I left feeling that the script just didn’t do this London poet justice.